Tonsils removal, breast reductions and snoring surgery will be offered to far fewer patients from next year, under plans being drawn up by NHS England. Officials are to discuss proposals to stop or reduce 17 routine procedures deemed to be "ineffective or risky". The treatment will be offered only if it is judged to be of "compelling" benefit and there are no alternatives. NHS England said the move would affect about 100,000 people every year and free up an estimated £200m. 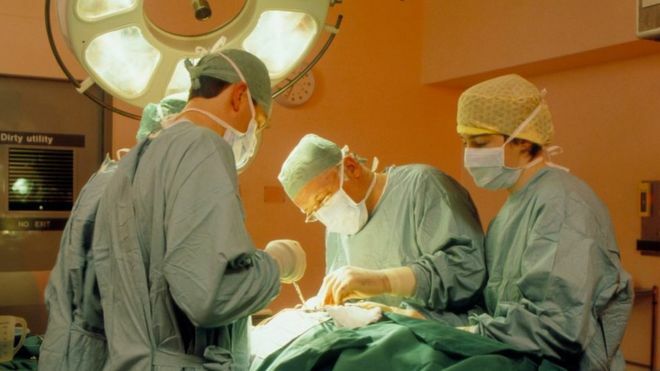 The British Society for Surgery of the Hand (BSSH) said cutting back on certain procedures would cost the economy more as people would be unable to work without surgery. Patients at risk of serious harm from their condition will continue to be offered treatment. It follows reviews last year to save £190m from supplying over-the-counter medications and treatments described as "low value". The announcement comes as thousands of people gathered in central London to mark the 70th anniversary of the NHS and demonstrate against cuts to the health service. Organisers of the rally, which include the People's Assembly - which campaigns against austerity cuts - and unions, are calling for more money for the NHS. NHS England says for most of the 17 procedures under consideration, alternative treatments including physiotherapy, a minor injection or change of diet are likely to be effective. It says the savings made by not carrying out the procedures will be reinvested in better frontline cancer, mental health and other critical services. Its national medical director, Prof Stephen Powis, said: "If we want the very best clinical care for our patients, we need to stop putting them through treatments where risks and harms outweigh the benefits. "By reducing unnecessary or risky procedures for some patients we can get better outcomes while reducing waste and targeting resource to where it is most needed." The plans have the backing of health professionals and the National Institute for Health and Care Excellence, which advises on the clinical benefits and cost-effectiveness of treatments. Which treatments will be affected? It is proposed four treatments will be offered only when a patient makes an individual request. These include surgery for snoring, where there is said to be only limited clinical evidence of effectiveness and which poses significant risks to patients. The others are: dilatation and curettage for heavy menstrual bleeding, knee arthroscopies for osteoarthritis and injections for non-specific back pain. NHS England plans to consult publicly on the proposals between 4 July and 28 September, with changes planned to start in 2019-20. Some have criticised the plans. Samantha Lilley, 29, was born with a rare genetic condition called epidermal nevus syndrome, which causes skin lesions. Throughout her life she has had procedures to help the physical and mental suffering but is worried about whether those would be discontinued. She said: "They're not life threatening, but they're painful and unsightly, to leave them would be detrimental to my health." She added: "My condition is lifelong. Is this what the NHS is now - that you must be at death's door to receive treatment? This isn't what it was created for - its purpose was to improve the quality of life of British citizens." Matthew Bennett from Bracknell, Berkshire, said having grommets for glue ear fitted when he was a boy fully restored his hearing. He also said his brother benefited hugely from an operation after severe tonsillitis meant he missed time at university time and lost him a job. Mr Bennett said: "If he hadn't had his tonsils out recently, he'd probably still be struggling with work." Anthony Stuart, a 52-year-old artist blacksmith, has Dupuytren's contracture - where fingers become permanently bent or flexed - and has had surgery on one of his hands to correct this. He is due to have another procedure to try to correct his other hand in July. He said the treatment had a huge positive impact on his condition. "I'm astounded that the government can call treatment for Dupuytren's ineffective," added Mr Stuart. "My consultant says if people don't have this procedure it could lead to amputation, which is even more costly to the NHS." How have medical professionals reacted? GP Brian Hope said he hoped publishing the list would make people come up with healthier solutions to certain problems. BSSH President David Shewring said conditions such as Mr Stuart's could force people to take time off work or stop altogether. He also said it was "wrong" to brand such procedures unnecessary or risky and did patients a "huge disservice". Physiotherapist Lucy Macdonald also welcomed the plans, saying she was pleased knee arthroscopies and shoulder decompressions would be limited, "because for a long time research has shown they are largely ineffective". Academy of Medical Royal Colleges chairwoman Prof Carrie MacEwen said the changes would benefit patients, clinicians and the NHS as a whole "by reducing harm and targeting those who will benefit most".